What is this so called feature called "Inscription?" - Advanced tailsman has higher success rate % and can be obtained from events, item mall, etc. Well that's what you are here for! Step 1: On the right side of your inventory, press the Synthesis tab and then when the portable function window shows up, click the Engrave tab at the top of it. Step 3: Drag your equipment that you want inscripted into the box there is will be appear success rate, for level one it is 100% and it goes down each time. 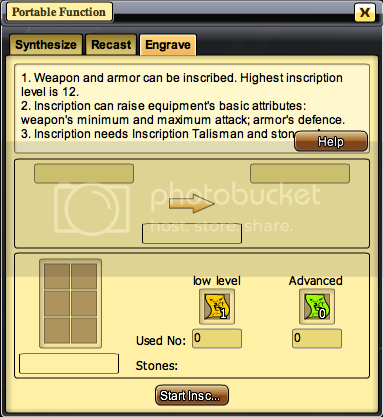 Step 4: Click start inscription, note that it costs stones to do so. if you inscription your equipment your minimum and maximum attack went up and if your inscript your armor your armor defence went up. its how you use the Inscription function on your equipment. Level 2 = 81%ninja.forum.game321.com8 D' v5 e* n) R+ M: H5 ? Sorry until now just untill level 2 because I forgot to write it.I will Update it soon.!! Stay tuned!! wow that's a big help..
i can't inscript my weapon even if i have a lot of low and advance inscription talisman..what's happening..?plz help me..
need help.. i currntly have 106 low talismans and wen i click 'start' a message appears 'not enough inscription talisman' .. wat the hell is dat? Hi to every single one, it's in fact a fastidious for me to pay a quick visit this website, it includes helpful Information.